WASHINGTON (CNS) — Whether it was deliberate or by accident, the Archdiocese of Washington announced on the 51st anniversary of the assassination of the Rev. Martin Luther King Jr. the selection of its new leader, set to become its first black archbishop. 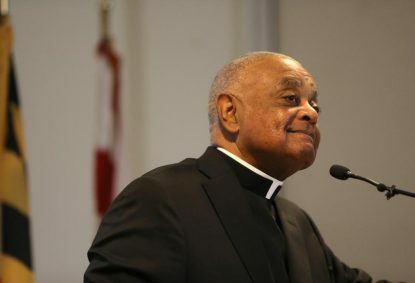 Various news stories noted the date and a reporter asked Archbishop Wilton D. Gregory — whose new appointment by Pope Francis was announced during an April 4 news conference — about the civil rights icon, a question that almost certainly would not have been asked of a white counterpart. He has been a member of the National Black Catholic Clergy Caucus and most recently, Sister Chapell said, he was involved with the U.S. Conference of Catholic Bishops’ statement “Open Wide Our Hearts: The Enduring Call to Love — A Pastoral Letter Against Racism,” approved by the bishops when they gathered as a body in Baltimore in November. “I consider myself a blessed man to have lived in Dr. King’s city for 14 years and witness the pervasive pride this city has for that man,” he said. At organizations such as Pax Christi, which fights against racism, “we stand ready to work with him and support him,” Sister Chappell said, and past developments show that he’s not afraid to talk about the issue. During the Atlanta news conference, Archbishop Gregory tried to set the tone that he’s an archbishop for the diverse archdiocese that he will soon be taking over, which also will includes a large and growing population of Latinos. In the past, he has often highlighted that population, the second-largest ethnic group in the Catholic Church in the U.S. and one whose plight he also seems to be focused on. “You’re a blessing and I think one of the things that happened in the Encuentro, which took place a few months ago, was that the Latino community had a chance to broadcast its dreams, its hopes, its vision, its desire to work with their fellow Catholics to build up the life of faith” in the U.S., he said. When asked in Atlanta what his appointment as the first black archbishop of Washington should signal to those who see limitations because of the color of their skin, he answered: “I hope that they take, whether they be Hispanic, Asian or African American, whatever their origin, I hope that my appointment to Washington, as I hope my appointment to Atlanta, will send them the message that they can dream big,” he said.